Mad Max: Fury Road reminds us that well-composed action movies using physical effects are more engaging than bombastic, CG hurricanes of chaos. Now YouTube user devinsupertramp (a.k.a. Devin Graham) makes the case that a similar approach can elevate fan films as well. If you’ve seen your share of well-intentioned, sterile Star Wars fan films starring overly serious amateur actors glowering in Jedi robes and Mandalorian armor, Mad Max GoKart Paintball War - 4K! is the perfect antidote. The in media res opening drops Max into peril, as he’s running from a motorized gang of thugs. Faithful to the DNA of the Mad Max franchise, the short provides an exciting wasteland car chase unencumbered by plotting. WB Games kicked in some money, which looks like it was spent on high-quality cameras that are handheld, truck-mounted, and drone-operated. 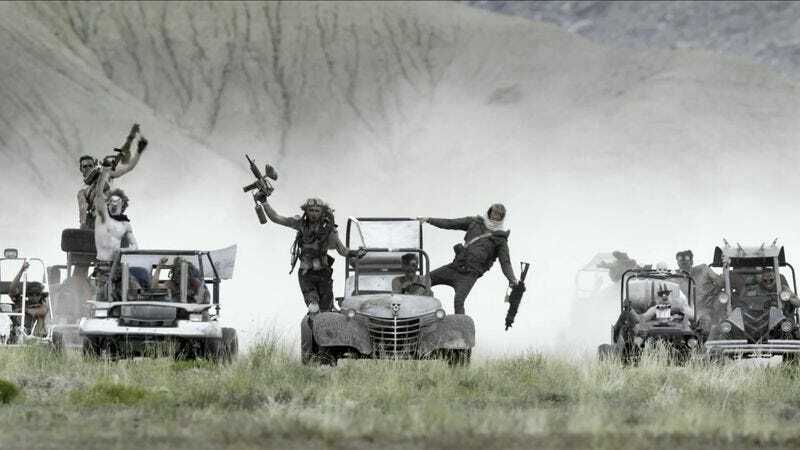 The actors faithfully reproduce the necessary intensity of wasteland thugs doggedly chasing their prey, and seeing that energy juxtaposed against adorable, post-apocalyptic Mario-Karts is delightful. For a three-minute short using vehicles that are 1/2 scale, don’t go over 20 miles an hour, and never blow up, there’s a surprising amount of action to be mined. And of course, Max gets away, so there’s hope that we’ll see more of these shorts, powered by adrenaline and two-stroke engines. UPDATE: It looks like there was a reason WB Games kicked in that cash. This is being used to promote the upcoming Mad Max: Fury Road video game. Which doesn’t make Graham’s fan film any less cool; it just makes it a savvy bit of marketing.